If you want to see a beautiful female bass player “google image” Esperanza Spalding. 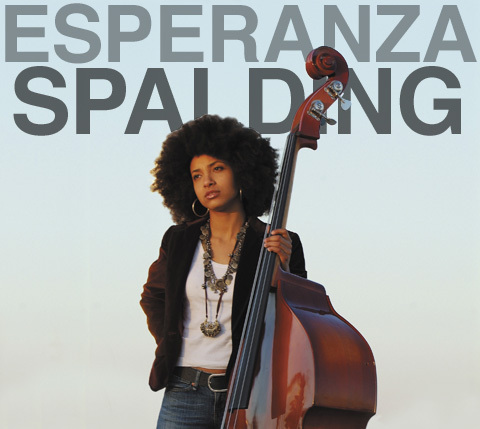 If you want to hear a really great contemporary jazz bass player listen to Esperanza Spalding. Last night, at the Village Vanguard, I saw the first truly inspiring famous bass player. I’ve heard many of the greats, but being that the bass is a male-dominated instrument, it was so refreshing to see and hear Esperanza Spalding, a female, play bass. Although, I play classical, it did not detract from seeing another female bassist who not only knew her way around the bass but looked so hip and cool doing it. Everyone stops me on the street with my bass and questions why such a “small girl” would pick such a “big instrument.” Hearing that over and over again gave me some sort of complex. Do people think I’m manly since I play this instrument? But Esperanza looked so feminine and beautiful playing her bass at the Vanguard last night, that I realized females playing the bass can be pretty cool and empowering. In 2011, she won a Grammy for Best New Artist. She has four solo albums out, but tours quite a bit. I highly recommend seeing her in person, as her stage presence is gushing with emotion and vivacity that can only be captured live.